2011 was an annus horribilis for me and my family. Having experienced three family deaths including my father's, whom I loved deeply and still do, amongst many other difficulties, made it a year that I would prefer to erase from the book of my life. There was one highlight though... we won the "Dream Day in Anguilla" contest organized by anguilla-beaches.com and generously sponsored by Carimar Beach Resort, Straw Hat and da'Vida. We set our travel dates for late November. When the day came I was happy on the surface, but had lingering feelings of deep sadness and unrest in my soul. I was looking forward to returning to the tiny island I had fallen head over heels in love with five years prior while traveling solo, but I was also afraid it would not be the same this time around due to my emotional state. While packing, it occurred to me that I would take something that belonged to my dad. I wanted to bury something that belonged to one of the people I love the most in what I consider heaven on earth. In retrospect, I see that I wanted to bury my sorrow in Anguilla. I wanted Anguilla to help me find some peace. Our first day on the island we sailed the deep, blue ocean on Chocolat and my dear wife, Kristen, was starting to take in Anguilla's beauty. Although I had tried my best to describe Anguilla's magic to her, she always had trouble understanding how Anguilla would be so different from other Caribbean islands we had visited. That night we sat on our balcony at Carimar Beach Resort and enjoyed the ocean breeze and a few cocktails. It had been a great day, but the sinking feeling of sadness came right back to me. The next couple of days were splendid. 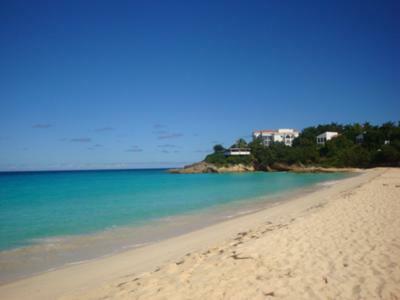 We enjoyed Meads Bay with its electric blue, clear waters and powdery plush sand. We got great massages, read our books, relaxed. We visited marvelous Rendezvous Bay where I had fallen in love with Anguilla a few years before. It was just as bright and pristine as I remembered and to cap off the day we had a memorable dinner at da'Vida. The food, ambiance and people were extraordinary. Our dream trip to Anguilla could not have been going better. However, my heart kept aching and my overall feeling of unrest kept looming around like a black cloud in the middle of a sunny day. One night, after having had a pleasant and interesting conversation with Bankie Banx at his Dune Preserve, we went back to Carimar and as I sat on our balcony enjoyed a view of the stars, I realized that I had probably expected too much of Anguilla. Its beautiful waters, gentle breezes, sunny days and wonderful people were indeed magic. But I realized that even Anguilla’s soothing magic was not enough to calm me down. I was wrong. Over the next couple of days, I started feeling different. Although nothing could erase my life's recent episodes, I started looking at them in a different light. I felt as if a huge rock had been lifted off my shoulders and almost suddenly I started feeling hopeful, grateful and rejuvenated. I felt reconnected with the world and, most importantly, with my beloved Kristen. 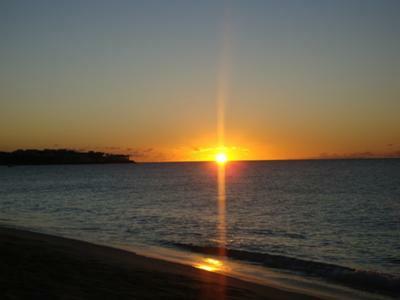 That was Anguilla's biggest gift to me, but there was one more. On our last morning on the island, we had a cup of coffee on our balcony and spoke about the wonderful week we had in Anguilla. We also talked about the things that had not happened including my wish to have found a conch shell to take back home as a keepsake of our first trip together to Anguilla. We had visited many beaches, but we had not found a whole conch shell and buying one was not the point. Kristen said, "Don't worry, we'll find one next trip." Then I knew that Anguilla had won her heart and that she was already counting on us returning. I just smiled. It was time to pay our last respects to Meads Bay. We went downstairs and slowly walked the beach towards Malliouhana. I wanted Kristen to see the little cove that formed between the rocks. I was also resolved to bury the small object that had belonged to my father after hesitating about it for the whole week. The sky was bright and the ocean was showing multiple shades of blue with waves that seemed to want to touch our feet. There was a mix of joy and sadness in the air as we knew we were to leave soon. We climbed the rocks and took in the sight of the ocean. Then, we walked down to the cove and where we found ourselves alone... only Anguilla and us. I swam into the water to find a place to bury my dad's object. When I got out of the water and sat on the beach next to my wife, I experienced a deep feeling of peace in my heart. After a few minutes of peaceful bliss we reluctantly decided to head back to Carimar. We took the last step down the rocks that separate the cove from the rest of the beach and I saw it... a beautiful white conch shell laying there on the sand! I picked it up with both hands and showed it to Kristen. With teary eyes she said, "She gave it to you." That was a moment we will never forget. Thank you Nori and Anguilla for an unforgettable trip. We look forward to returning to Paradise in the near future! Nori's Reply: Ricardo, you and Kristen experienced so much of Anguilla! 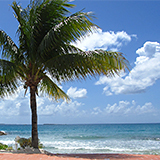 From The Dune Preserve to Chocolat to your many walks on Meads Bay... It sounds like a wonderful vacation, and it sounds like Kristen fell in love with the island. I am so happy for her new discovery! I am sorry for your hard year and for your loss, Ricardo. 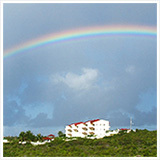 Anguilla's healing powers are magical, and it fills me with joy to hear that you have found peace. I am thankful to be a part of a most special trip to Anguilla. All I can say is I loved reading this story. 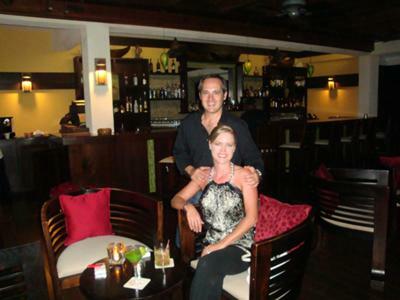 Anguilla has worked her magic yet again for such a dear deserving couple. So happy that someone found peace and comfort on our favorite island. It was so hard to share this beautiful place with anyone, but I am happy that "our secret" was shared with someone who really needed it. I know the feeling. Our family lost two very important members in the past six months and we are counting the days till we can get back to our "home" in North Hill.